All aboard! Who says you have to be at Disneyland to ride this futuristic train? Want more than just Monorail Services? Gliding from the MGM Grand to the site of the old Sahara, the Monorail Las Vegas is a convenient way to casino hop when you don't want to walk. Air conditioned and equipped with a voice that tells Las Vegas jokes, the Las Vegas monorail route is one of the best ways to get around the Strip. 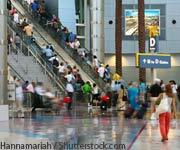 Monorail Las Vegas boasts meeting more than 99 percent of its scheduled stops on time. Monorail Las Vegas is eco-friendly and climate-controlled. The Monorail Las Vegas is geared towards tourists visiting multiple Las Vegas monorail hotels, yet is usually not crowded. 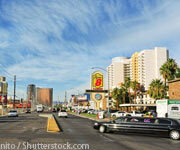 Monorail Las Vegas serves more than 60 different hotels and destinations through its clean and convenient service. Trams arrive every 4-12 minutes, depending on the time of day and how busy the Las Vegas monorail hotels are. More than 60 Las Vegas monorail hotels are served through seven main stations. The Las Vegas monorail hotel stations include MGM Grand, Bally's and Paris Las Vegas, Flamingo and Caesar's Palace, Harrah's and Imperial Palace, and LVH Las Vegas. Nearly 64 total Las Vegas monorail hotels are easily accessible through the Las Vegas monorail route. The Las Vegas Monorail is a handy alternative transport when casino hopping on the Strip. Quick: The ride is 15 minutes or less on every single Monorail ride so don't worry about sacrificing time for price! Accessible: The monorail is open until 2am so don't even worry about staggering back to your hotel after hitting the clubs, the monorail will take you there! Comfortable: Noiseless, air-conditioned, and walking-in-heels-free. It doesn't get better than this. Yes. A one-day pass for Monorail Las Vegas NV costs $12, which is about how much a single one-way taxi ride will cost on the Strip. I usually take the monorail at least for one 24 hour period on every trip. Once I bought the 3 day pass. When I stay at MGM, it really comes in handy. I like to walk but hate walking in crowds and on The Strip. The monorail gets me away from the outside heat and crowds and is easy and safe to use. Since it does go in back of the properties, there is sometimes a bit of walking involved but it is usually good to walk off a few calories. I find it very handy and have stayed at the Mirage, walked across the street to the Harrah's stop with my luggage, taken the monorail down to MGM and exited right at the hotel lobby to check in there. There are two exits at MGM. One goes to Casino and one to hotel lobby. It actually can get a little isolated sometimes but I've never felt unsafe. The trains come often. I am female and usually go to Las Vegas alone. I am staying at Mirage this November and will buy the 24 hour pass so I can get down to MGM easily from Harrah's and from MGM, I can walk/take trams to Luxor and Mandalay Bay.